When I was 21 and on my first trip to Europe, I stayed at an expensive hotel in Paris close to the Arc du Triomphe. I stayed up late listening to the sounds of the city anxiously awaiting the next morning to go out and do some sight-seeing. I had set an ambitious agenda that required getting up very early. The next morning, instead of taking the prehistoric elevator down four floors, I opted for the staircase with what looked like a ceiling to floor window with opaque glass. As I ran down the stairs, I noticed that the landing was dark; the window ostensibly did not go all the way to the ground floor. Nevertheless, I continued down the stairs, just a little more slowly. A scenario flashed through my mind: "21-year-old with questionable French found unconscious in eerie stairwell in expensive Paris hotel." However, my ambitious sight-seeing agenda quickly got the upper hand. I stepped up my pace down the long circular staircase, but there seemed to be an interminable number of stairs, which made me feel as though I was dancing and not really getting anywhere....I eventually soft-shoed my way to the first floor and noticed that the window did in fact stop there, but cast enough light for me to see the wall at the foot of the stairs, but little else. As I arrived at the landing with my hand on the newel of the staircase, I turned in the general direction of what I assumed was an exit, although there was no illuminated sign (Doesn't this country have a building code!?). Then I saw something from the corner of my eye. I turned and looked up to see a very tall woman with her hand raised as though she were about to hit me. I brought up my arm to shield my face from the blow and screamed. I heard several people laugh in the next room. I maintained my pose for a few seconds and then reached up and felt the evil lady's hand. It was hard and didn't move. My would-be attacker was a statue. Too embarrassed to walk into the lobby, I lingered in the semi-darkness and had a good look at how the first floor window cast just enough light onto the statue to trick my eye into believing that this woman was real. Although red in the face when I entered the lobby, the hotel concierge assured me that I was one of many people who screamed at the sight of the statue. The hotel owner had stowed the (evil) lady under the staircase until he figured out a better place for her. Besides this memory, I have had similar though not quite as vocal reactions to retail mannequins. For some reason, a double-take has always been necessary. What is this inherent eeriness of human replicas that Alfred Hitchcock used to such terrifying effect? At the 3December Autodesk presentation, I learned that in 3D animation circles this effect is known as the "uncanny valley." In 1970, Japanese roboticist Masahori Mori hypothesized that as a robot becomes more human like in appearance, our reaction towards the robot is increasingly positive and empathetic. That is... up to a certain point. Then our reaction quickly turns to repulsion. In other words, this is when we get that creepy feeling. 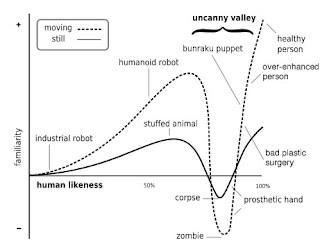 Mannequins, bad plastic surgery, and ah...statues fall into the uncanny valley category (See the graphic courtesy of Wikipedia for other examples.). Ryan Lesser and Josh Randall of Harmonix, the developer of the video game the Beatles: the Rock Band, spoke at the Autodesk conference on the importance of recreating the Fab Four to make them seem real but avoiding any uncanny valley pitfalls. Lesser and Randall's show-and-tell session demonstrated how important it was to capture the essence of the Beatles by studying their every movement and even their interaction in their onstage performances. I was stunned by how much of Harmonix's facsimile of the Beatles actually coincided with my memories of their individual characteristics without creeping me out. And yes, John, Paul, George and Ringo appeared to be just as lovable as they did in real life....I guess. The picture of this woman in the upper right-hand corner is CGI Flash Creepy Girl (Just click on the link and watch Creepy's eyes follow your cursor.) 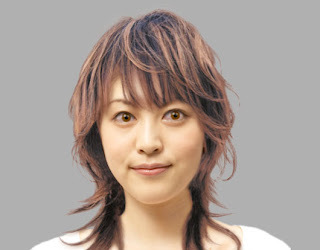 She's a pretty believable computer-generated image except for something in the eye movement, the redness of her eyes and the fact that her hair on her shoulders doesn't move. Try for yourself and let me know if you have noticed anything else that seems unhuman like. In addition, if you're interested, on this same site you can send a picture of yourself, and they can make a creepy computer-generated image of you too. : The Uncomfortably StrangeTweet this! No. That would be my oriental cousin from my robotic, creepy valley side.